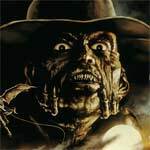 Jeepers Creepers 2 isn’t anything great and doesn’t quite have the same atmosphere as the first half of the original, however on the whole it’s still an entertaining horror-thriller with more tinge of humor thrown in this go around. The cast, outside of Ray Wise, aren’t as memorable and a few are more than obnoxious (albeit purposefully). 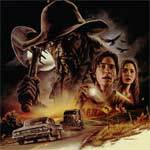 Jeepers Creepers works as a decent creature feature, albeit an uneven one with a great first half (solid 4/5) but devolves in the second half to standard fare. That said, Victor Salva’s film offers some good scares, nice performances by Justin Long and Gina Philips who work well opposite one another and some respectable make-up work.